"Sound is really important for aquatic animals, it travels well under water and fish use it to find food, hiding places and even to communicate," said lead author Catarina Vila-Pouca from the Department of Biological Sciences. "It was obvious that the sharks knew that they had to do something when the classical music was played, but they couldn't figure out that they had to go to a different location," said Associate Professor Brown. "Sharks are generally underestimated when it comes to learning abilities – most people see them as mindless, instinctive animals. "However, they have really big brains and are obviously much smarter than we give them credit for. "Gaining a better understanding of this will help grow positive public opinion of sharks and may shift public and political will towards their conservation." "So we played the sharks Jazz, and then we played them Classical, and we were like come on figure it out!" There is nothing in this article that suggests sharks prefer jazz music. There is an implied suggestion that the researchers themselves prefer jazz music however. Also that the research seems to be as unfocused and disconnected as a typical jazz tune. "Sharks can acquire a taste for jazz music". No they can't - read the paper. 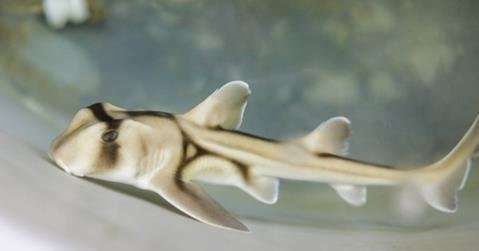 Sharks were unable to distinguish jazz from classical music. There was no evidence of "liking" or "acquiring a taste for" one sort of music. What the study did show - if you bother to read it - is that sharks could learn to tell the difference between no music playing and jazz music playing. This is not the same as "liking jazz". Poor and lazy journalism.